2015 brought two volumes of verse by authors whose previous works are central to the contemporary war poetry corpus. Interestingly, neither of the new works address Iraq or Afghanistan directly or at length. In The Arranged Marriage, Jehanne Dubrow, the author of Stateside, a collection exploring a military spouse’s anxiety about deployment, now gives us a collection of poems based on the life of her mother, who was forced into an abusive marriage in her native Central America. In Icarian Flux, Colin D. Halloran, the author of the verse-memoir Shortly Thereafter, about his Army tour in Afghanistan, imaginatively considers the myth of Icarus. Both volumes offer strong models of artists engaged with and even formed by military experience, but who refuse to let their art or their identities be defined by war and service. We might remain alert, however, for overlaps, lingering traces, and subtler forms of connection to the military even as we consider Dubrow’s and Halloran’s new interests in their own lights. Leaving The Arranged Marriage for another day’s discussion, here I’ll briefly explore Icarian Flux’s very interesting post-war and post-war-lit dimensions. the stars from the other side…. is that you’re not alone. I’m driving on the tops of trees. Poetry’s generalized and abstract symbolic register, reliant not on accessible biography and obvious narration, but figurative setting and privately-observed detail, is not for everyone, or even anyone all the time. But those of us who love it, especially as we consider specific poems in the context of what we do know about their authors and their total body of work, will greatly appreciate Icarian Flux. We all fall, Halloran reminds us, and the getting-back-up-again is never as simple and easy as conventional homilies and platitudes would have it. 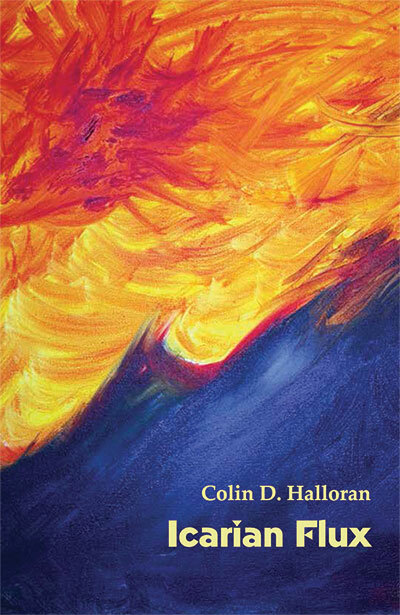 From one angle, stripping his poetry of the freighted terminology of deployment and trauma might be seen as Halloran’s effort to broaden his appeal to readers resistant to the rhetoric of veteran woe. A better read is that Halloran has drawn on the wider range of cultural resources to speak of loss and low periods in ways that encompass the entirety of human life and are not dependent merely on one aspect of it. Colin D. Halloran, Icarian Flux. Main Street Rag Publishing Company, 2015. The quoted passages have been slightly modified due to the limitations of WordPress.